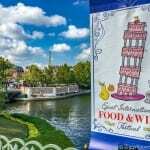 By now you know that the 2018 Epcot Food and Wine Festival is Now Open and serving up hundreds of delicious food and drink items. Especially if you’ve been before you already know your go-to favorites you get every time. 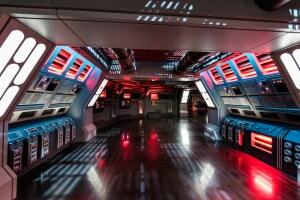 You know, the Pork Belly in Brazil, Cheddar Cheese Soup in Canada and Chocolate Liquid Nitrogen at Chocolate Studio. 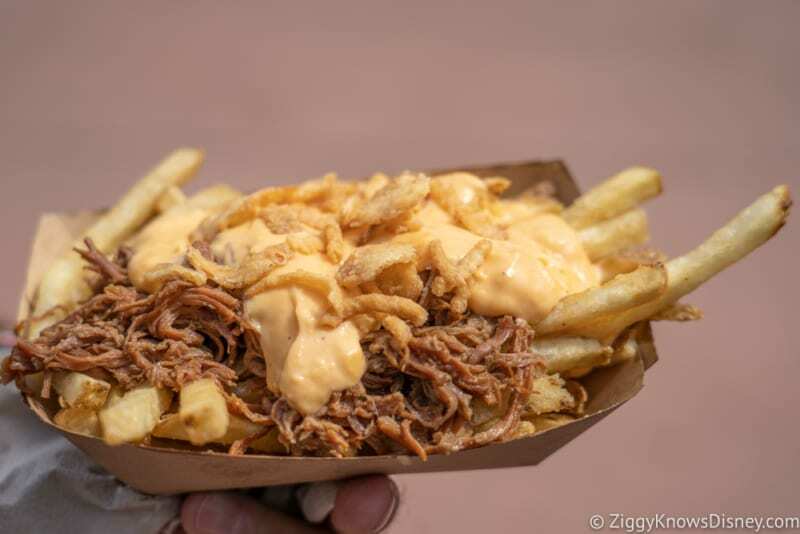 But sometimes you don’t want to keep eating the same things over and over every time, you want to find the best new snacks from the Food and Wine Festival. But with so many to choose from that’s a lot of tasting to do! 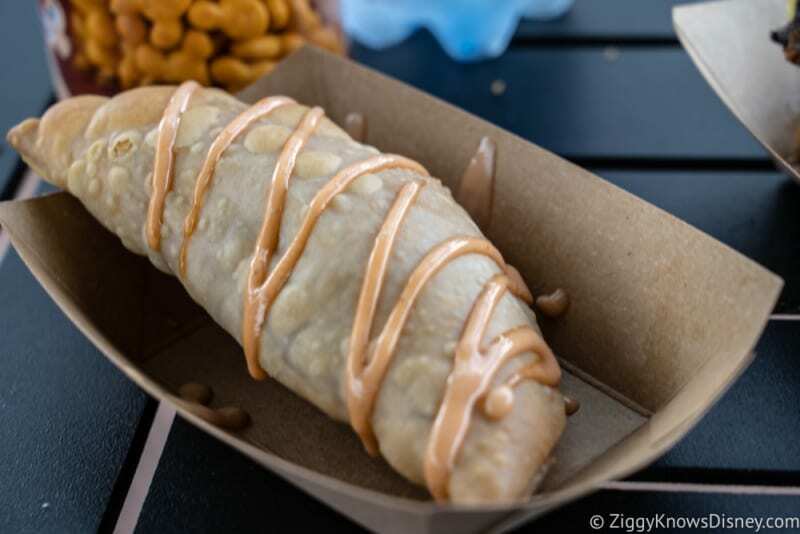 Luckily we tasted everything already from all 35 Marketplaces for you and we found the 11 MUST-TRY NEW Items from the 2018 Epcot Food and Wine Festival! I hope you’re not hungry as you read this, because you WILL BE after! I didn’t think I’d like this slider so much, but it’s awesome! First of all it’s a big portion, which can be hard to find at Food and Wine sometimes. Secondly it was cooked perfectly and was super juicy, which is also hard to do when cooking for this many people. It’s covered in a brie cheese fondue which was just running out the sides and the blue cheese potato chip adds another level of texture and gives it a nice crunch. The veggie slider at Earth Eats is ok, but if you eat meat, make sure you get the Steakhouse Blended Burger instead! So I hated last year’s risotto from The Almond Orchard. It was too watery and nutty for risotto. But a dip with spinach, cheese and artichokes is a whole other ballgame, and this is miles ahead of last year! This was amazing! Super gooey and cheesy, perfect consistency and a really rich flavor. Not sure if it’s the best value at $5.00, but it’s super yummy and I’ll be getting it again and again! You know that thing a lot of people believe in called “Love at first sight?” I didn’t think it existed before seeing the Beef Brisket Poutine, then I was quickly convinced! First of all they give you a GIGANTIC portion of food here that can easily be split by 2 or 3 people. The fries are abundant and crispy and they are just pilled on by a deliciously moist beef brisket and globs of, wait for it….Cheese Sauce!! Then topped off with some crispy I’ve been to Canada multiple times for poutine and I’ll take this version any day because the fries don’t get all soggy and they stay crisp. 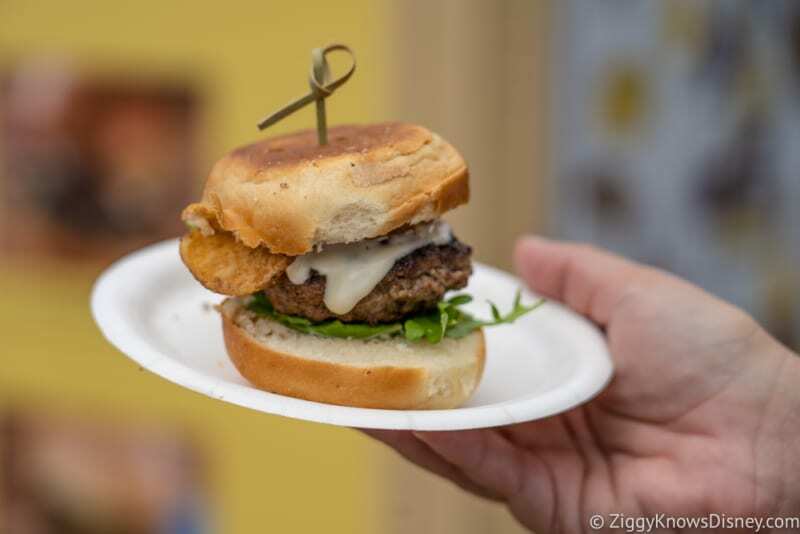 If you don’t try this at Food and Wine this year you are missing out, big time! So usually during the Food and Wine Festival I don’t make a point of trying too many non-alcoholic drinks, but the Phosphorescent Phreeze from Light Lab was one that I just couldn’t resist. It’s an awesome blend of fruit juices broken down into 3 different layers. It’s expensive at $7.00, but you have to understand this thing was HUGE and I couldn’t even finish it myself. It’s super refreshing too if you are really hot from the Florida heat and you are looking for something substantial to cool you down. 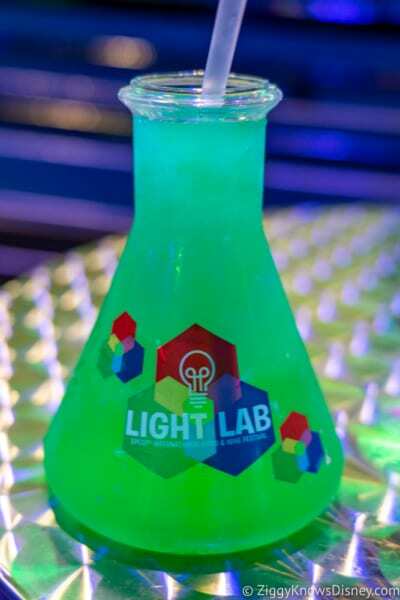 Plus you also get to keep the souvenir glass as a keepsake, which displays the Light Lab logo. It’s a bit sweet, but especially if you have kids this will be their favorite drink at Food and Wine for sure and a must-do! France always has some kind of beef dish, usually beef bourguignon. This was done a little different this year and was slow braised with pieces of bacon and onions, served on top of creamy mashed potatoes and covered in a savory beef gravy. I thought the beef was very tender and succulent, and the portion was pretty good too. The bacon just put it over the top for me and you could really taste it in the sauce. Great option for meat lovers and I”ll take it over the Escargot any day! 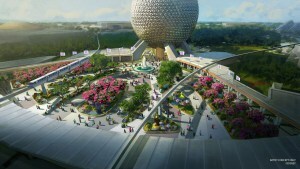 I’m super critical of the Italy pavilion, and Italian food in general since we live most of the year in Italy. So when I hear fritto misto, it gets me worried that it won’t be like it is back home. Even though this wasn’t a cheap option, they really loaded it with fried shrimp, much more than other pavilions like China, etc. The breading was very, very light, and mostly done only with flour and seasonings. The sweet potato fries on top were a nice surprise, as well as the spicy sauce. Honestly the food itself was so packed with flavor it didn’t even need it. 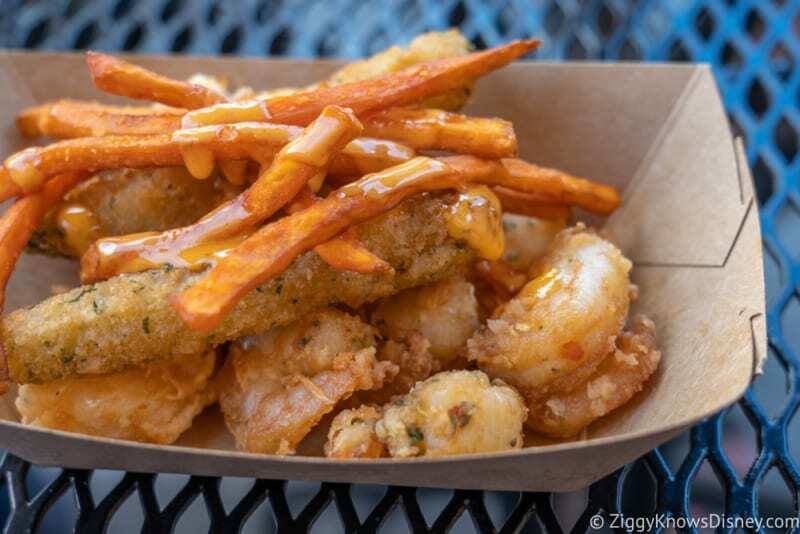 If you like fried veggies and shrimp then this is your place! Not the biggest portion at Food and Wine, but definitely one of the most flavor-packed! If you are a pancake fan then you’ll love this unique twist on a savory treat. 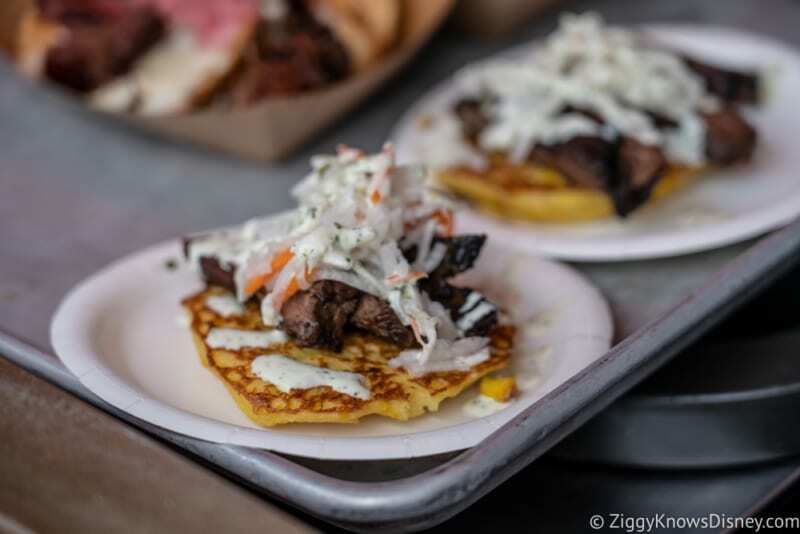 It’s a smoked corn cake, pilled high with this amazingly tender skirt steak which has been grilled to perfection out back and rubbed in a chimichurri sauce. I’m not a big slaw guy, but it was covered in a cilantro aioli which added even more flavor to it. 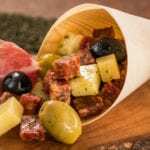 I know that the Smoked Corned Beef gets all the attention at Flavors of Fire, but this should not be passed up by any means! OMG do I love this thing!! The first moment my mouth touched it I was in heaven! It has a very thin cookie base, but the story is that center. This is no Philadelphia cream cheese cake. The cheese here is so light and fluffy that it practically melts in your mouth. It’s also covered with a delicious maple bourbon cream sauce that accents the cheesecake perfectly. 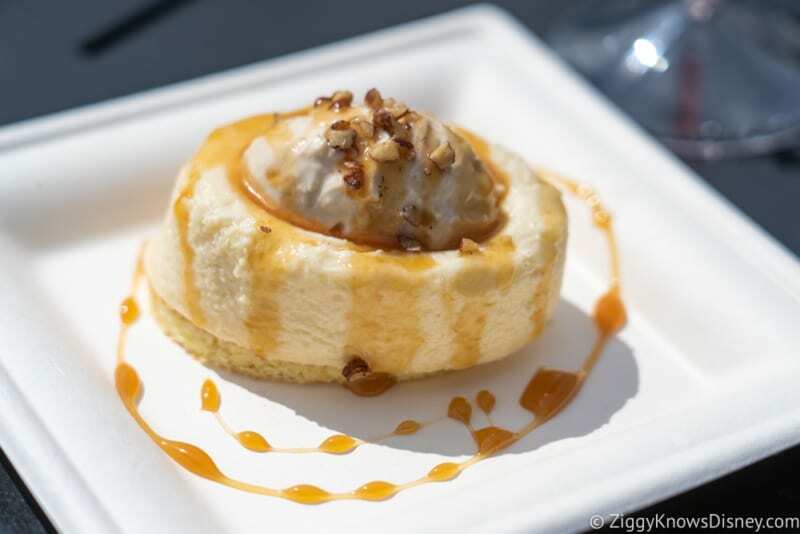 If you only get one dessert at Food and Wine this year, make it this! 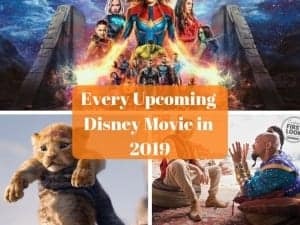 You won’t regret it!! The Ropa Vieja Empanada is a great option in the Islands of the Caribbean marketplace. This thing is HUGE and a steal at $5.25! The empanada is made from a massive, flaky shell that breaks apart easily when you bite into it. 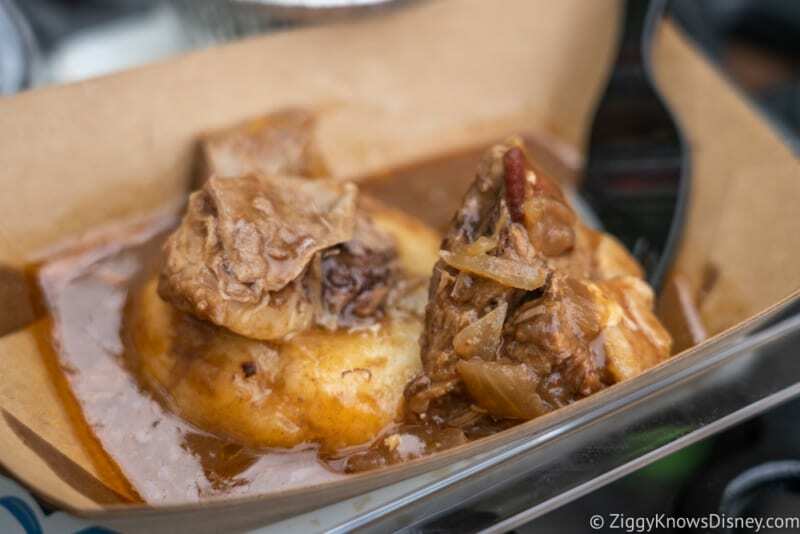 It’s stuffed with a beef mixture which uses traditional Caribbean spices, though it’s not too spicy. The meat is very juicy inside and the tomato aioli on top adds more to the juiciness of this dish. This is a major upgrade from the Jamaican Beef Patties from last year which basically cost the same for half the food and weren’t any good. So glad they made this change and you’ll be too once you try it! If you have tried the Cheeseburger Pods at Satu’li Canteen and like those, you’ll love the Teriyaki Chicken Buns in Japan. 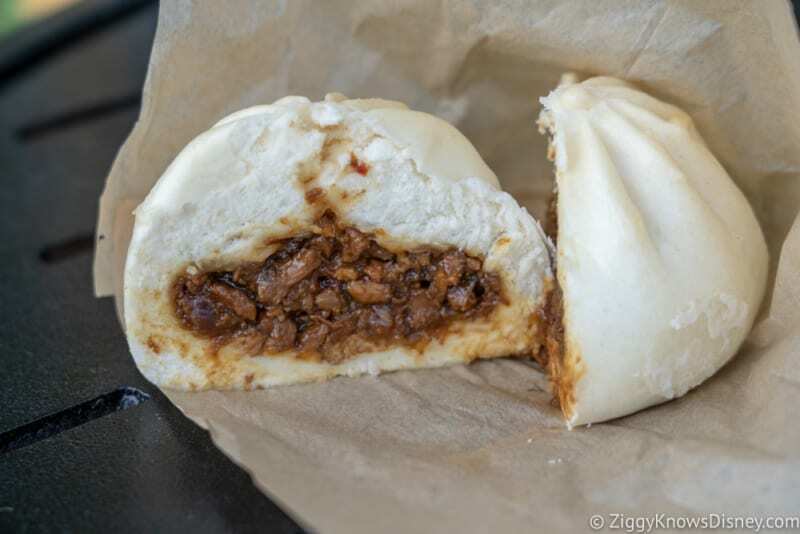 The bun itself is very squishy and soft and it’s filled with a delicious mixture of diced chicken in a teriyaki glaze sauce. I thought the portion size was pretty good, but the flavor of that chicken will leave your mouth watering for more! This was one of the more controversial snacks our group tasted and we were split down the middle. I however loved it and found that it was a tremendous value. This is one of the biggest items at Food and Wine and it also tastes really good! 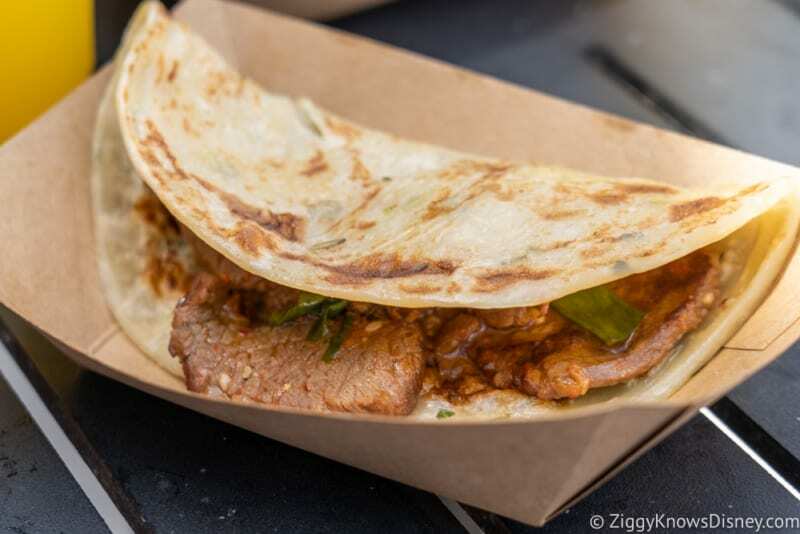 The beef inside is very tender and has a great spicy flavor. The pancake though is was caused the most conversation with some saying it’s too chewy and undercooked. I really liked the consistency of it and love the crisp outside texture. 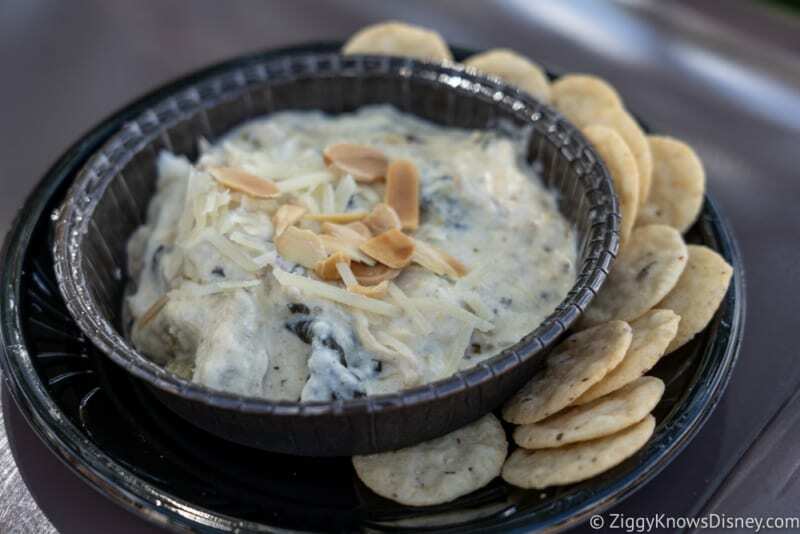 Don’t leave the Food and Wine Festival without giving this a try!